Security has always been a pretty high priority for any one regardless of the era that one lives in. Even if you were one of those cave dwellers in the past, surely you know how to set up a barrier at the mouth of the cave to make sure that you can sleep easy during the night so that no unwanted guests come in and perhaps snack on one of your family members, right? Fast forward to the modern day, where dinosaurs are all but extinct, here we are with Noke, touted to be the first Bluetooth padlock in the whole world. There is just this thing about padlocks – their keys tend to go missing by accident from time to time, and this “phenomena” seems to happen more often than not to some, and for those combination padlocks, it can be all too easy to forget the combination if you do not open it up every day and commit it to memory. 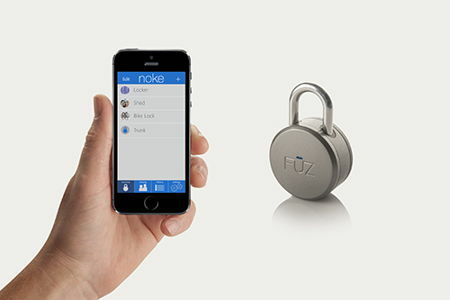 Noke is here to save the day, being a Bluetooth padlock that one is able to share with the others. FŪZ Designs came up with the Noke Bluetooth padlock which will work in tandem with your smartphone, giving you easy access to all the important things in your life. Not only that, you are also able to share access to your possessions easily, safely, and securely. You will first need to download the iOS or Android app, where Noke will then automatically hunt down and pair itself up to your Bluetooth 4.0 enabled smartphone. Not only that, one is also able to name your Noke and even give it a photo if you so desire. Unlocking the Noke requires you to press the shank, that’s all there is to it. As long as your handset is within 10 feet, Noke will instantly unlock without the need to launch an app or remove your phone from your pocket or purse.